As an Atlantic Canadian gamer I'm always excited to discover other gamers and reviewers in my area. It doesn't happen as much as I wished it would which is part of the reason I started blogging in the first place. Recently I discovered, Vesuvius Media. You can imagine my excitement when I found out that this indie publisher is based out of Halifax, just four hours from home. I'm very pleased to have gotten my hands on their most recent release, a game called Dwar7s Winter. Shuffle the monster cards and place the monster deck to the left of the board. Place the monster minatures near this deck. Shuffle the disaster cards and place the disaster deck to the right of the board. Place the disaster tokens near this deck. Reveal disaster cards based on the number of players and place a disaster token on the corresponding areas of the board. 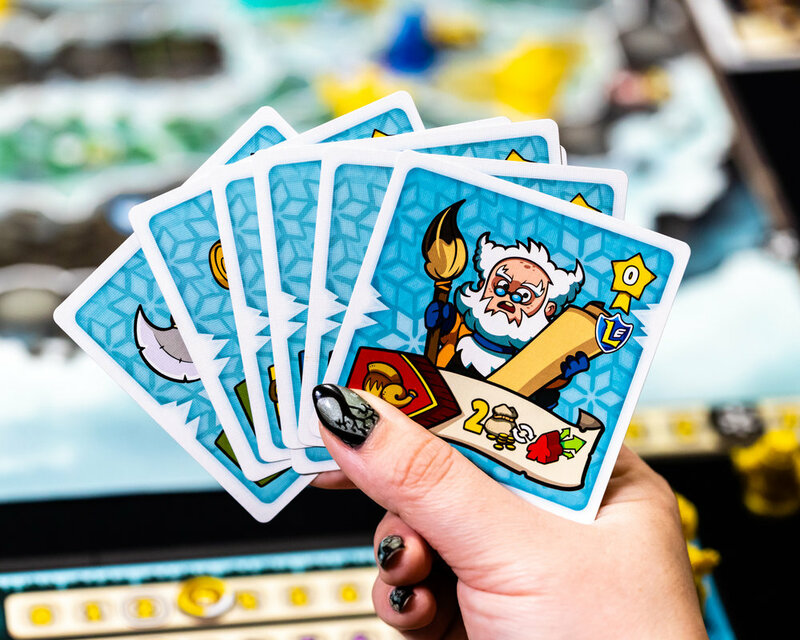 Shuffle the hero deck and place 4 cards face up to create the hero pool at the top of the board. Place the winter token on the 1 spit of the winter track on the game board. Each player takes a player board, one set of player markers, 1 music token, 7 starting hero cards and 7 dwarf miniatures. On your player board place the coin marker on the 2 space of the gold track. Place the crate markers on the 2 space of the food, stone and wood tracks. Place one scroll marker on the 5 spot of the action track and one scroll marker on the 7 spot of the hand size track. Place all dwarf miniatures on your board. The first player places 0 dwarfs on the board. The second player places 1 dwarf on any zone of the board. The third player places 2 dwarfs on any one zone of the board. The fourth player places 2 dwarfs on any one zone of the board. Refresh tracks: All players reset their hand-size tracks to 7 and their action tracks to 5. Monsters attack: The first player decides the order the monsters move. Move each monster one zone closer to the castle then resolve the monster's attack. Each monster has an ability that will affect game play for that round. 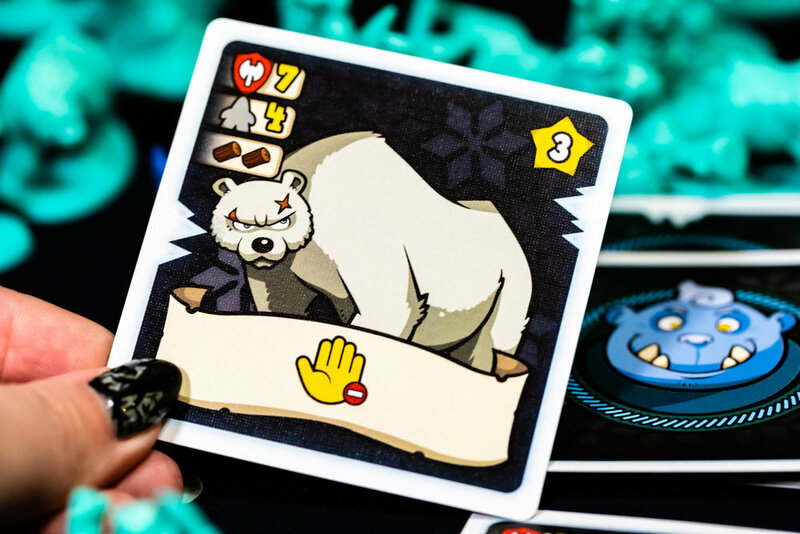 Monster reinforcements: Based on the number of players spawn new monsters by turning over a card from the monster deck and placing it's miniature on the corresponding zone on the board. Reveal a disaster: The first player turns over a card from the disaster deck and places a disaster token on the corresponding zone of the board. Preparation: Players look at the cards in their action deck and choose a number of cards indicated by their hand size track. Starting with the first player, each player takes a number of actions indicated by the number on their action track. Place a dwarf from their player board in any zone, but may never place 2 dwarfs from their player board in the same zone during the same turn. Move a dwarf on the game board to any adjacent zone. Defeat a monster: If a player occupies the same zone as a monster and has the required number of dwarfs and resources they may defeat it. The player returns any dwarfs used to defeat the monster to their player board, adjusts their resource tracks, removes the monster miniature from the game board and places the monster card face down near their player board. Overcome a disaster: If a player occupies the same zone as a disaster and has the required number of dwarfs and resources they may overcome it. 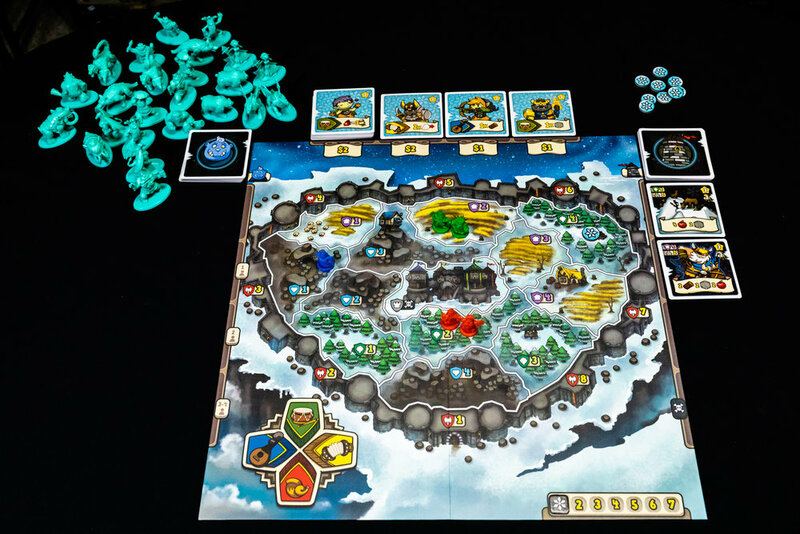 The player returns dwarfs used to overcome the disaster to their player board, adjusts their resource tracks accordingly, claims the gold reward, removes the disaster token from the game board and places the disaster card face down near their player board. If you have 4 disasters on the board or a monster inside the castle then all players lose the game. Move the winter token one spot to the right on the winter track. Pass the first player token to the next player (clockwise). At the end of the 7th round, if you have not lost the castle to monsters or been overhwhelmed by disasters then you survive the winter and players tally their victory points. As soon as I opened the box I was extremely pleased with what came inside. Tons of miniatures come with this game for a very reasonable price when compared to other miniature compromised games. The game could easily be played with monster tokens instead of miniatures so I am very pleased with their decision to include these. The monster miniatures are quite a bit larger that the dwarf miniatures making it much more aesthetically pleasing. They didn't miss any details on the rest of the components either with the exception of one card, the plague doctor, who's ability was misprinted. They put a lot of thought into this game and went above an beyond with the details of their components. The player board tokens have the player colors printed on the back. The disaster tokens are printed on both sides so you don't have to worry about a less appealing pile of brown cardboard backs on the table. The rule book was just okay for me. They definitely tried to deliver on the quality here but were just shy of a perfect mark. Luckily they are very responsive to email so I was able to quickly have my questions clarified and they are already looking into a reviewing the rule book before their second printing. They are also in the works of formulating an FAQ for their kickstarter page. As a newer company I completely expect some small hiccups and I can appreciate how quickly they are working to rectify it. Usually I'm a stickler for rule books but in this case It's not something I will hold against the game or the manufacturer. Aside from the few questions we sought clarification on, this game was actually really easy to get started. The rule book was a quick read and easy to explain. Lots of photos as well which is really helpful. All players very quickly caught on to the rules including my friends 10 year old son. Despite being so easy to understand there is a LOT of decisions you have to make in this game. You simply can't do everything you would like to in a round which is an aspect I really enjoyed. The board state consistently not being in your favour makes the decisions you do have to make even harder. I tend to not enjoy cooperative games because I feel like the game plays me instead of me playing the game - Dwar7s Winter did not give me this feeling. Every decision you make is critical but it's not easy to pinpoint exactly your best move would be. This is a bonus, not a flaw. Even though you have to work together and make some decisions together, you still need to make sure you end the game with the most points. Both games I played were considerably friendly however if your group is more competitive things could get a little bit more cut-throat as you compete to fight bigger monsters for more points thus making your opponents rethink their strategy and possibly replan their entire turn. At first I wasn't sure how I felt about the possibility that we could all lose the game at the end of a round if the board state was out of control. It seemed like it would be nearly impossible to win right from the get-go but I promise it's not as bad as you think. It plays a factor in why decision making is so critical and truly makes the game more fun as you learn to adapt to the constant changes on the board. After playing with 4 players I wasn't confident the game would uphold the same quality of play at 2 or 3 players but I was wrong. A 2 player game was even more ominous than the 4 player game. We definitely had some moments of panic but were still able to overcome the challenges. The most challenging aspect was realizing at most only 2 instruments can be played per round. For us the game definitely didn't end in the 45 minutes suggested on the box. I would say closer to an hour for a 4 player game if everyone knows how to play, unless for some reason you guys are all brilliant speed players. The amount time spent making all those important decisions definitely has a big impact on the length of the game. In my second game I added the Legendary Expansion that came in box. This expansion adds some new heroes, monsters and disasters. 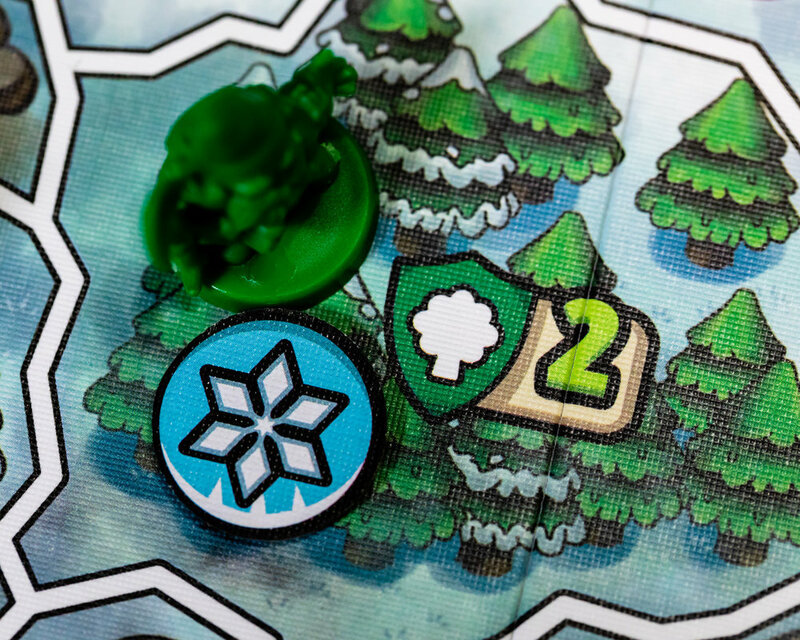 In the expansion you see the introduction of the snowball effect - when revealing a disaster if the disaster is in the same location as another disaster and you have less than 4 disasters on the the board, a new disaster is revealed. Yikes! Most importantly it adds 3 legendary dwarf upgrades per player. Each dwarf has a special ability and is worth 2 points at the end of the game. This is a very small but quality addition to the game. Once you add it I feel confident you won't be playing again without it. The game also has an option for solo game play. I personally haven't tried this but I think it could work very well if solo tabletop gaming is something you enjoy. Dwar7s winter is a solid game that I would recommend for most gamers. 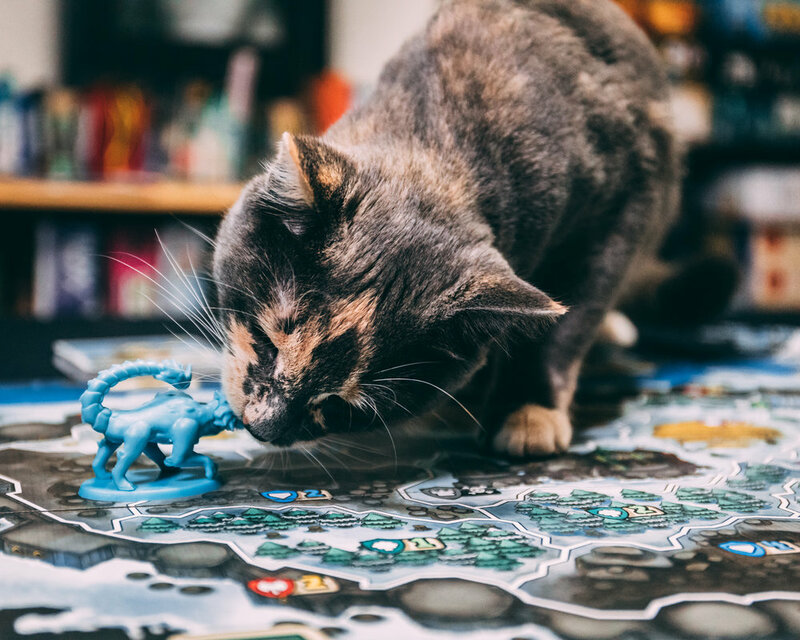 The rules are easy enough that someone new to board games could easily learn them on their own and the tactical approach required is challenging enough to appeal to a wide variety of experienced gamers. I've compiled a list of the questions we had after our first game and the responses the Vesuvius Media team provided. I know they are working on their own detailed FAQ so I would recommend checking that out when it's ready. Q: During set up it does not say to reveal monsters but in the image for a 4 player set up it shows 4 monsters revealed. Are the monsters revealed during setup or during phase 1.3 of the first round? A: During Setup you do NOT spawn any monsters. The rules mention only Disasters that you should spawn based on the number of players. I understand the confusion with the setup image, so we will have it changed in the next print run. Q: During set up it says "in clockwise order from the first play, the second player places 1 dwarf". Does the first place place 1 or 0 dwarves during this phase? A: The first player does not place ANY dwarfs. Q: One of the monsters abilities is "choose one other monster and move it once". It doesn't specify in which direction. Does the monster targeted by this ability have to move one space towards the castle or can it be in any direction? A: Monsters ONLY move towards the Castle. No other direction. Q: When spending an action to place dwarfs from your player board you may never place two dwarves in the same zone during the same turn. One of the action cards allows you to place or move two or your dwarves. If using the action card can the two dwarves be placed in the same zone? If no, can one dwarf placed from the action card be placed in the same zone as a dwarf that was placed by spending an action? A: The restriction of placing more than a Dwarf in the same zone is per "Player's Turn". That applies to any way you get to execute a "Place a Dwarf" from your Player board to the board. BUT, that said, if you play the card by following the music during another's player turn, then you can do it. Q: When you play music can you stop between playing action cards to do a free action and then continue playing action cards or do all action cards need to be resolved prior to the free actions? A: "Playing a Music" is considered an "action". So you need to finish it before executing any other actions. That includes "Free Actions". Presently only available from the Vesuvius Media website.